A healthy relationship with alcohol depends on how you feel about your drinking and whether you think you’re making the most of your weekends and living a fulfilling life, or whether there is room for improvement. We support people to find a balance that works for them at the time. For healthy men and women, drinking no more than two (2) standard drinks on any day reduces the lifetime risk of harm from alcohol-related disease or injury. As soon as we have a drink, our brains start producing dopamine which makes us feel euphoric. They also produce a neurochemical called GABA, which makes us feel relaxed. Once we have had a couple of drinks, the inhibitory parts of our brains are affected too, so it is much harder to make the decision to stop drinking. For some people it is especially hard to stop once your blood alcohol content is above a certain amount, and that is based on your genetics and personality. Often what happens is that we are used to having a drink to bring on those feelings of happiness, or to take away feelings of sadness/loss/boredom/anxiety, but then it is hard to stop there. That is a really common issue and one that takes time to change. We really like the buzz from the dopamine and those feelings of calm from the increase in GABA, but that doesn’t last as we become more affected by the alcohol itself. After a while we are not necessarily happy and relaxed, but it is challenging to stop drinking at that stage as it can be uncomfortable to sober up (we can feel tired, or moody as our BAC adjusts). We can keep drinking to maintain that feeling in our brains, but we tend to get tired as the intoxicating effects of alcohol take hold and we feel the need to drink more due to the sugar content of alcohol giving us more energy. Everyone is different in how alcohol affects them, based on your gender, history, diet, level of arousal in your brain, and tolerance to alcohol and other substances. When am I likely to drink? When do I feel like drinking the least? When do I most feel like drinking? If I tend to have a drink after work to relax and wind down after the day, perhaps I can plan to do something that will give me a sense of relaxation and peace around that time. Alternatively, I can ensure that I do things to look after myself during the day, so I don’t feel so stressed by the end of it. If I notice that I am likely to drink on a date in order to lower my levels of anxiety, it might be helpful to explore what I am anxious about, and find other ways to relax and feel comfortable when meeting new people. Once you can understand your triggers and urges to drink, then the fun part comes in – building a wall around those triggers and urges! It might be something like setting yourself a goal of three months alcohol free, and making sure that you have a replacement behaviour when you would be likely to drink. You can also try a practical approach, like getting rid of triggers. For example, try keeping no alcohol in the house or letting those close to you know that you have decided to make a change. We recommend signing up to the Daybreak program and speaking to a Health Coach about strategies for stopping, as well as posting on the Daybreak feed and commenting on other’s posts. A lot of evidence around what helps people to stop drinking indicates that peer support is very helpful in helping people to make changes and stick to them. Having a community of people around you who are going through the same thing, or have gone through it before, is invaluable. If you have a trigger or urge that is particularly strong, chances are that someone has gone through that before, and will have some advice to share with you about how to get through it. How do I make changes to my drinking? I might remember a time three years ago when I trained for a half marathon. What kinds of things were helpful in working towards that? If these changes included peer support, having a routine, having set goals and having a clear date to work towards, then chances are that these are the things that will work for me to make other changes. The other thing to consider is that change comes in different stages: precontemplation; contemplation; ambivalence; preparation; action; maintenance and (potentially) relapse. We are all at different stages of change with lots of things in our lives. We might be in the ‘contemplation’ stage about starting an exercise regime, but might be kicked into ‘preparation’ or ‘action’ by an upcoming holiday or an appointment with our doctor. It might be helpful to reflect on what stage of change you are in now. Whether you are in ‘action’ or if you are moving between contemplation and preparation. On any given day, we may even slip back into ‘pre-contemplation’ or ‘relapse’. That is okay. It is part of the change process to fluctuate between these. 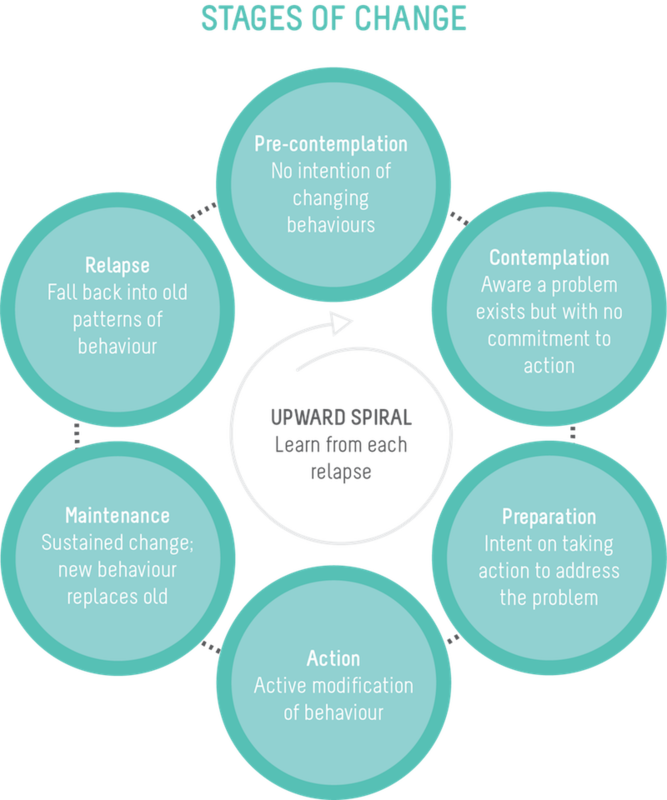 Being aware of where you are in the cycle of change can be really helpful in making lasting change. How do I help my friends and family develop a better relationship with alcohol? Do you think your drinking is an issue? What do you think you are getting from drinking? How would you want to change your relationship with alcohol? At the end of the day, we don’t have much control over someone’s behaviour, but if we can reflect back to them what we are seeing, and present some options for them to get support, it is possible that they will hear what we are saying and take some of it on board. Generally people change their behaviour when there are more reasons to change than stay the same. So our job is to accurately reflect reality and help them to see that there is a strong argument for change. Does Hello Sunday Morning provide an AA alternative? A physical meeting may not be suitable for those who feel that something like an AA meeting is too confronting – to share their experience of cutting back or quitting drinking with complete strangers. The same goes for people who live in remote areas or have kids and responsibilities that keep them from finding the time to attend these meetings as often as they need. Daybreak is an alcohol support group program created from years of experience by the Hello Sunday Morning team. 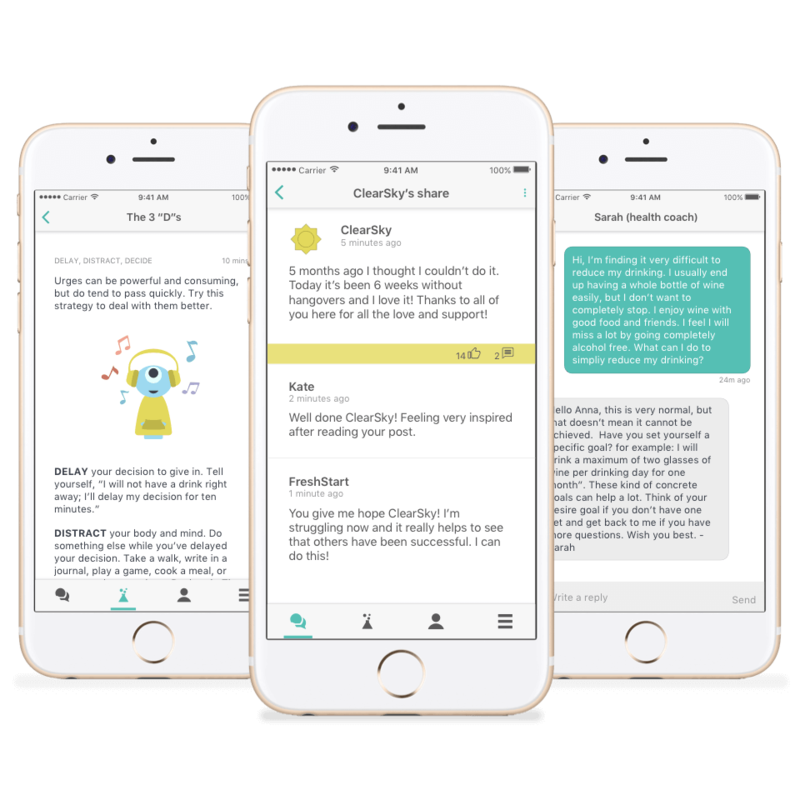 It is a great alternative that provides an anonymous space, with a supportive community of people going through different stages of their own journey to recovery.